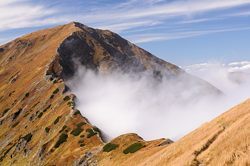 In this section you will find photographs from four trips in Malá Fatra mountain range that I did in 2012. I like these mountains most when there is at least a bit of snow on the peaks and so the pictures here are from hikes during Easter holidays and then from November and December. 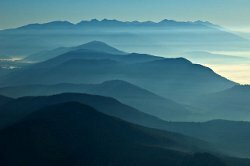 I've been going to Western Tatras every late September for many years now and on many occasions I was lucky to have very nice weather and enjoyed the well known sceneries. This year, however, there were remarkably wonderful low clouds in the valleys while we were basking in the sun on the top of the ridge. In this album you'll also find a few pictures from a trip to Baranec in August and to Velký Choč in September. 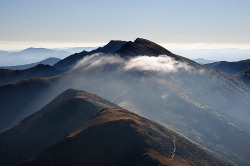 My vacation in 2012 was long gone in summer and so I only did a couple of small trips, mostly to Slovakian mountains. 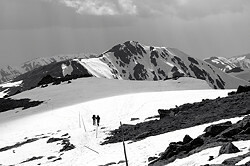 In this section there are pictures from a visit to High and Low Tatras. This summer was the last before a cable car began operating up to Chopok and so probably the last one with a reasonable number of people on a sunny day there. 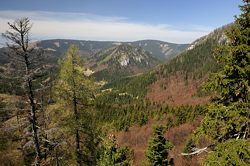 I've been planing a trip to Muráňská planina for quite some time so I was easily persuaded to go there this spring instead of a traditional hike in Nízké Tatry. We started from Polomka, climbed Fabová hola and then went via Nižnú to Muráň, Muráňský hrad and through Velká lúka to Červený kameň. That took us three dyas and we an extra one to climb Královu hola, so we also went to Tatry after all. 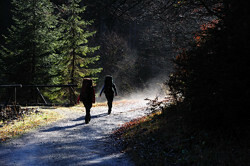 I November I realized I had not been to Velka Fatra this year, decided to make up for that and much to my delight two friends joined me despite an uncertain weather forecast. Apparently it had been raining just before we arrived but we enjoyed more than our fair share of autumn sun. October is not normally considered a winter month, however in 2009 it was nearly so. Calamitous amounts of snow have fallen on mountains and forests where the leaves were still on trees and created a colorful winter scenery. 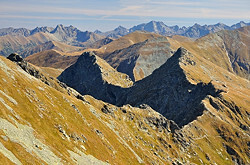 When the weather is fine in Western Tatras in the very end of September, hikes are remembered for a long long time. Bus to Tatranská Javorina on Sunday morning. 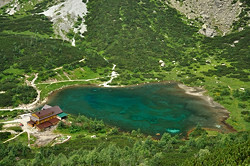 Walked to Zelené pleso first, then climbed up and down Jahňací štít. Sunrise at Zelené pleso in very early next morning. Finally hiked to Skalnaté pleso and descended to Starý Smokovec. Crossing of Low Tatras from Télgart to Liptovská Lužná. In the valleys there was already spring but the higher parts of the main ridge were covered in snow. 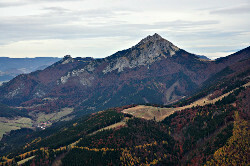 The old Czechoslovak independence day at Velká Fatra. Went up through Gaderská dolina (valley) to Ostredok (the highest peak), spent night at Chata pod Borišovom, climbed Rakytov and descended through Teplá dolina. 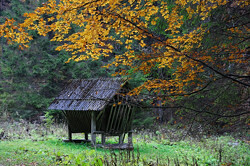 Another photographic trip to Choč, this time in early spring. 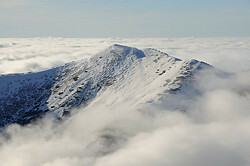 As you can see, it is a wonderful place with spectacular views even when there isn't a meteorological inversion. 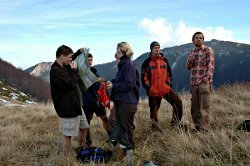 On the New Year's day of 2010 we have hiked from Bránica valley to the peak of Velký Kriváň. The weather was awful and even though we had joked about getting above the clouds eventually, we were very pleasantly surprised when we actually did. 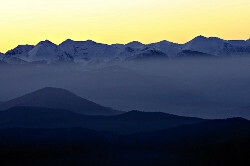 Only both Kriváňs and the peaks of High Tatras in the distance emerged from the clouds below. 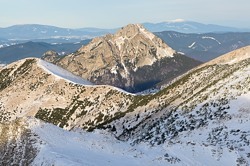 Pictures from a hike on one of the lateral ridges of Malá Fatra. From Vrátná valley up to pass Sedlo za Kravarským and then on top of Kravarské, Žitné and Baraniarky and then again down to Vrátná. 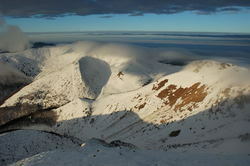 In 2008 the weather foiled most of my photographic attempts in Slovakia. At last in October when we went to have a look at the autumn low clouds from above, from the top of Velký Choč mountain, conditions were just right again. Clouds were low in the end of December 2007 but work has kept me from going to mountains until it was almost late. I have arrived at Chata pod Suchym in Mala Fatra just before sunset and the next day the clouds already started pouring over the ridge. That was a very interesting view too. Forecasted low fog and clear skies above it made me spend a weekend at Velky Choc, a mountain with great views of all major Slovak mountain ranges. 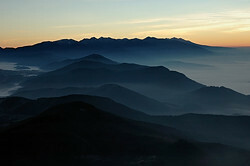 Despite missing the sunrise the second day by a few minutes the trip and the views was at least as good as predicted. The main purpose of going to Mala Fatra this time was to cut some wood for winter. However, there is always time for a small trip to the very top of the range.